I was very pleased today to find that work has commenced again at this site. There are once again a great many workers and unlike other dig sites, here they seem to work at a good pace and not in slow motion. 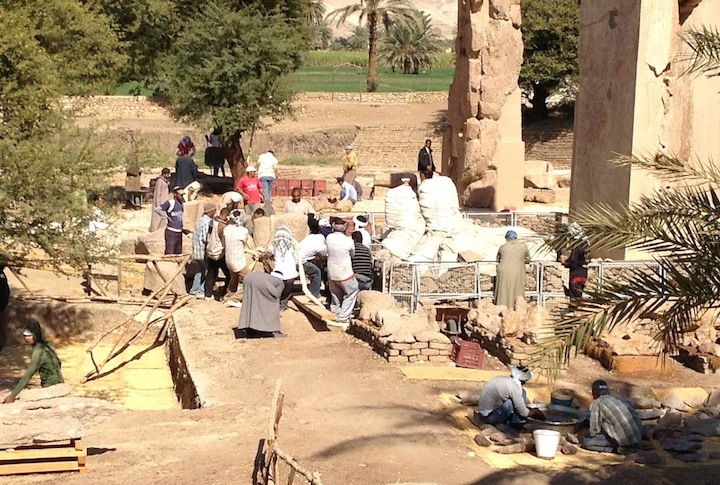 Today they were pulling a large stone block into its final resting place. 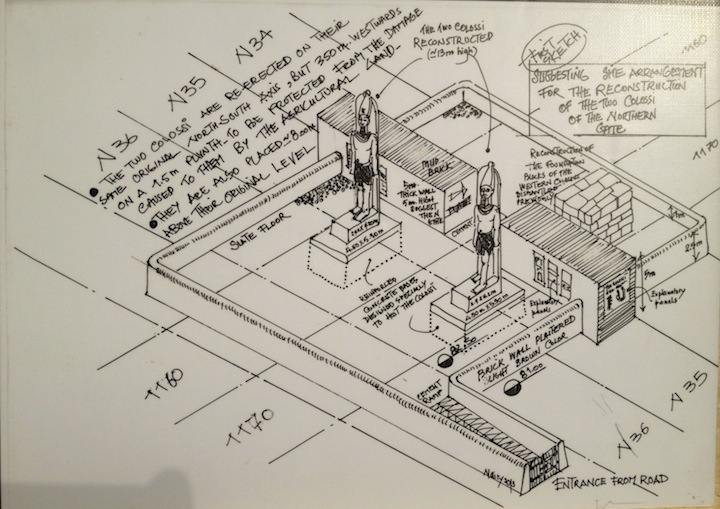 I have noticed a great many plinths have been built to mount and display objects that have been found here. There is still a large area towards the Ticket Office waiting to be excavated and today a saw a group of men looking at this area. 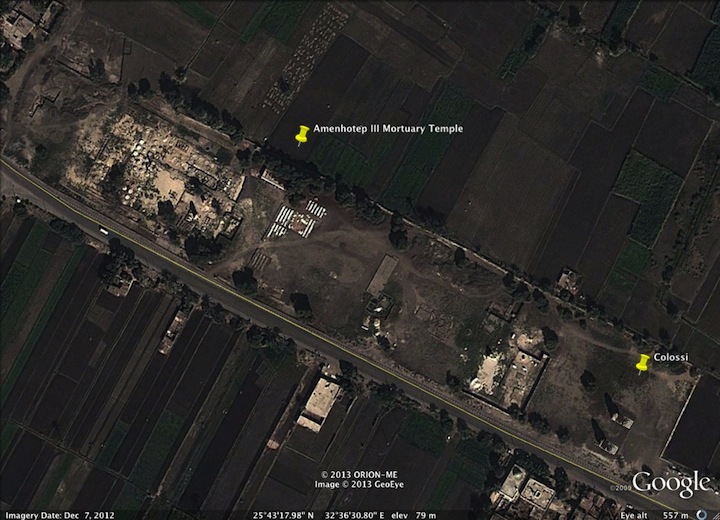 The Amenhotep III temple (Kom el-Hetan) its modern name, was built from between 1390 to 1353 B.C. 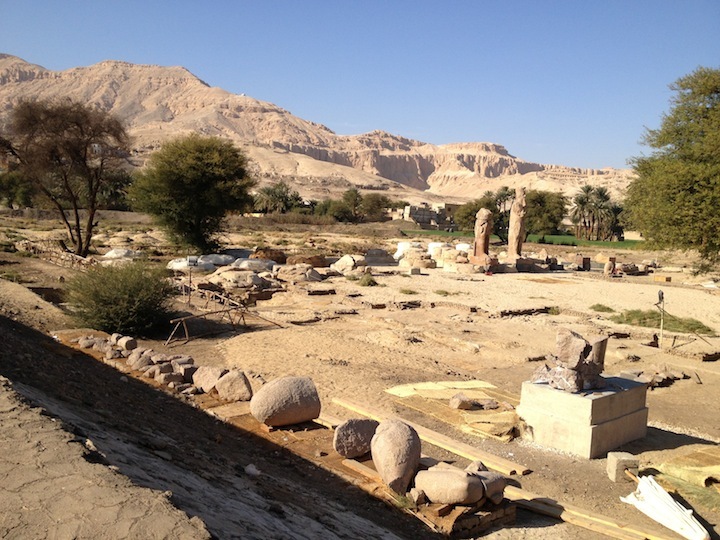 (Dynasty XVIII) for Amenhotep III, the New Kingdom Pharaoh. It is about 100 meters wide and 600meters long. 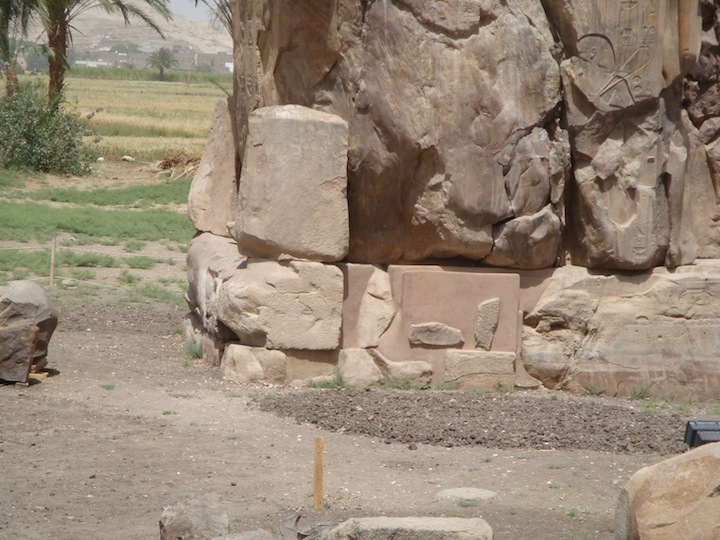 It was the largest temple to be built of the West Bank. 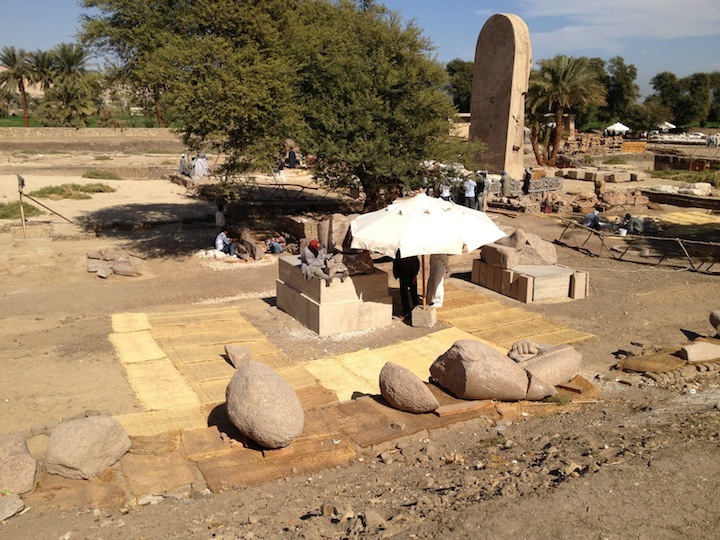 Most of the temple was built during the last ten years of Amenhotep III reign. 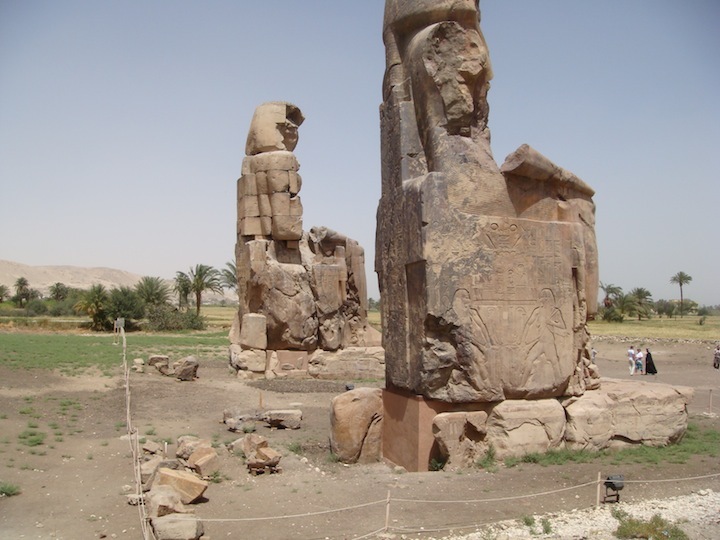 The Colossi of Amenhotep III (Memnon) stood at the entrance to the temple along with smaller statues of Queens Tiye and Mutemwiya at their feet. 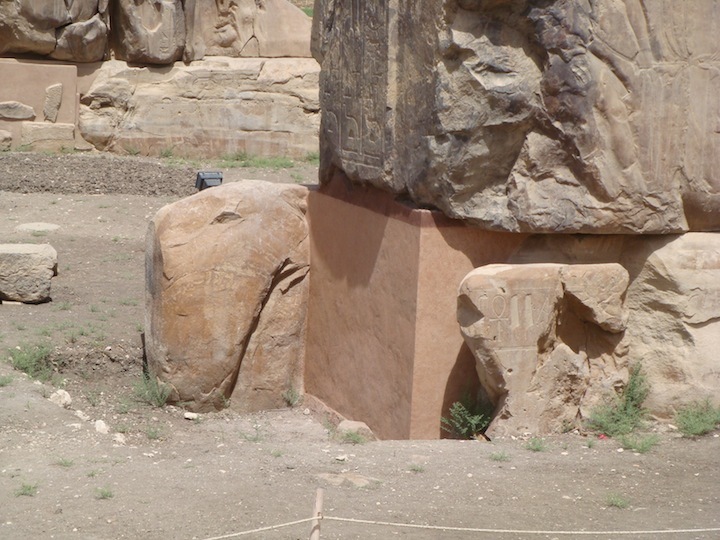 There were also jackal statues on high pedestals as well as Osirid statues of the king. 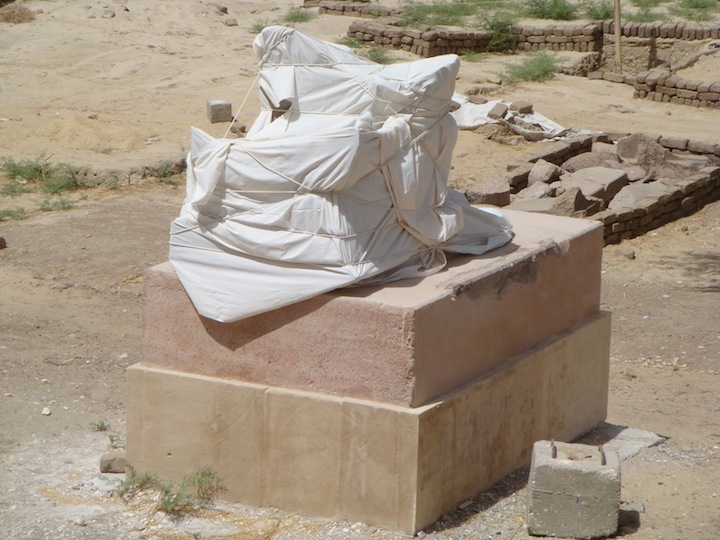 Another headless sphinx with the body of a crocodile was found in 1957 in situ on the southern side of the temple site, and can still be seen today along with many more recent finds. 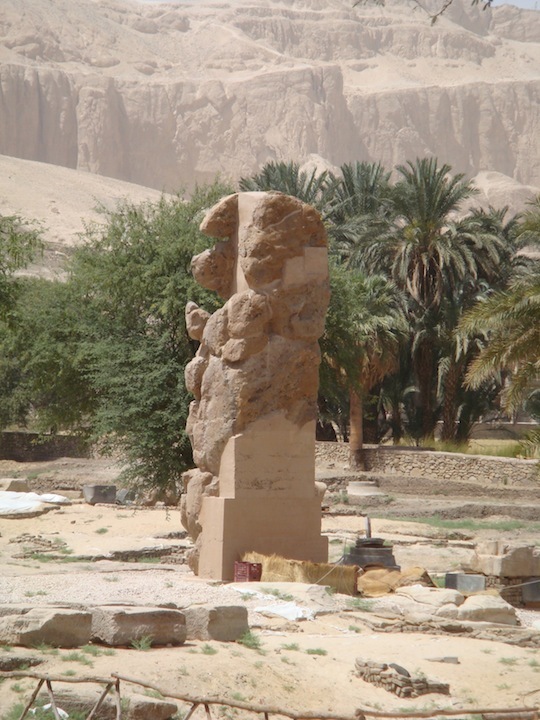 All Egyptian temples and shrines had many statues of the king and deities scattered around their courts, but this Amenhotep must have surpassed the usual amount of sculptures. It has been suggested that Amenhotep depicted the ‘Litany of Sekhmet’ by including a standing and a seated statue of the goddess for each day of the year. 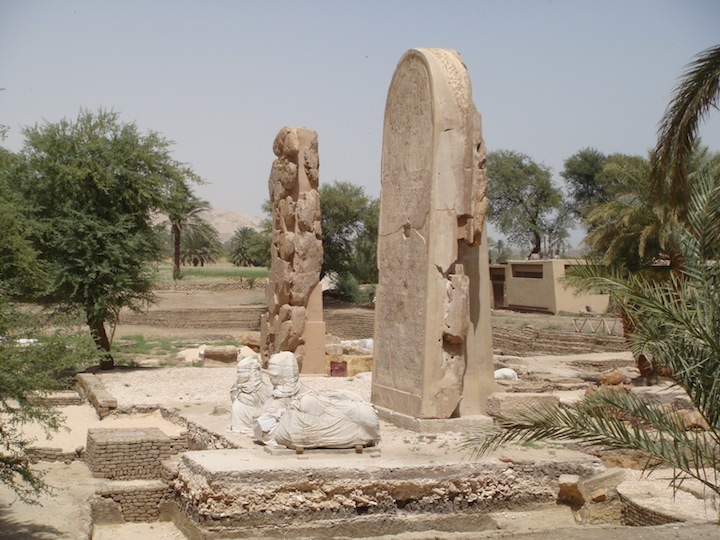 Amenhotep’s chief architect was Amenhotep, son of Hapu, who gained such importance in the royal court that he was granted his own mortuary temple near Medinet Habu and was even deified in later Ptolemaic times. A lot of work has been done in the time I have been living here. There is still a lot more to be done and to be found. When I spoke to one of the team last year, they told me that they were finding something new at the rate of one piece every one and a half weeks. It is an exciting site as each day you can see the progress being made. 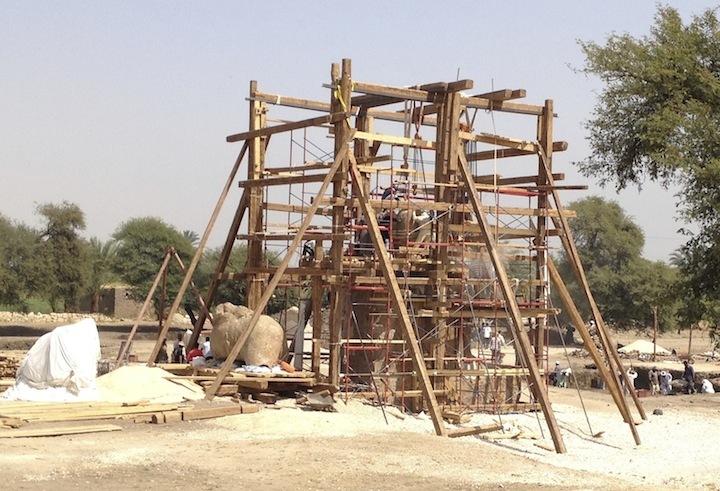 The site is not open to the public but you can walk along the road pathway aside of it to take in the enormity of the temple site. Be careful when taking pictures, its best if they do not see you taking them. They are very protective of this site as is the case with many. 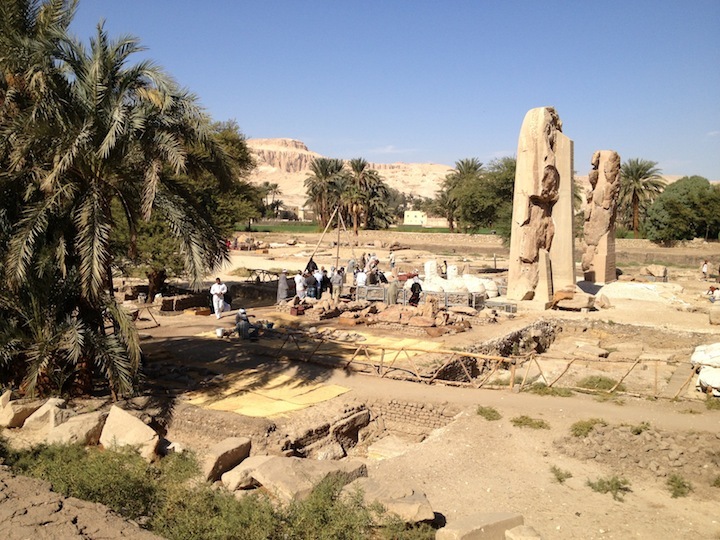 Here the men are pulling a fragment of a colossi. To the right of the center is the piece they were pulling. Here they are attempting to piece together a statue on a plinth. 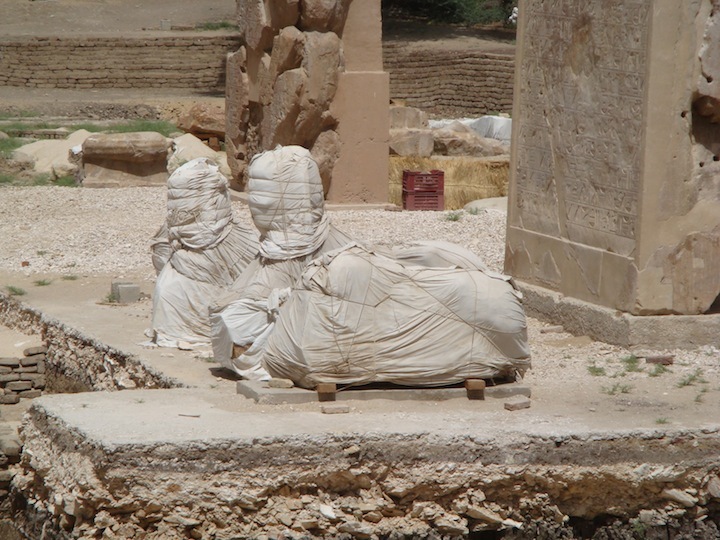 With Amenhotep III Mortuary Temple, all the new finds are covered in white sheets. 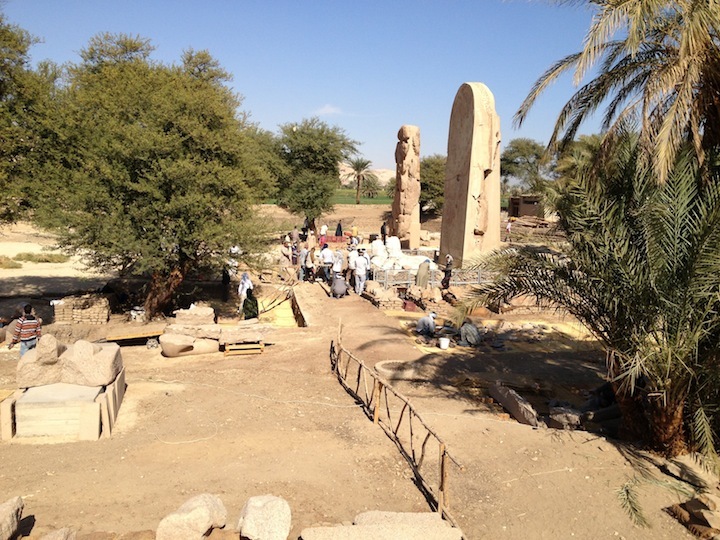 They have done some great work this year on the South site with the rebuilding of many colossi, statues and monuments and on the North site they have built the bases where they will re-build two 13 meter high colossi. 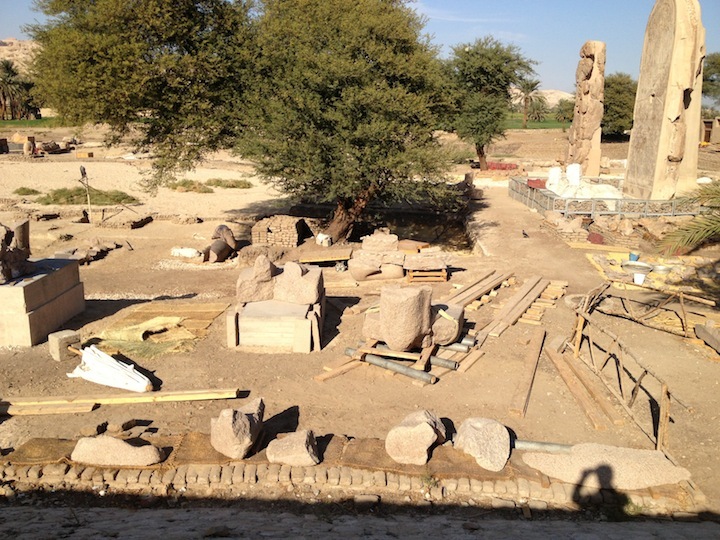 All the pieces have been removed from the North pit where the colossi pieces were found and the land levelled and returned to the owner. 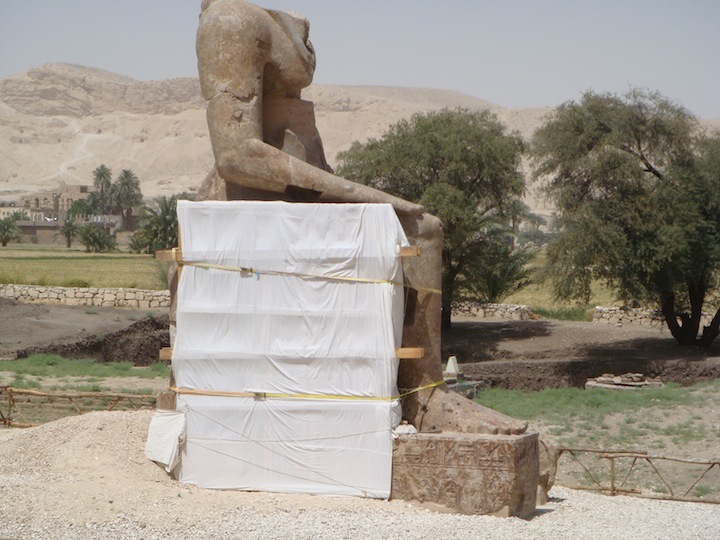 A statue that they have been patiently re-assembling. 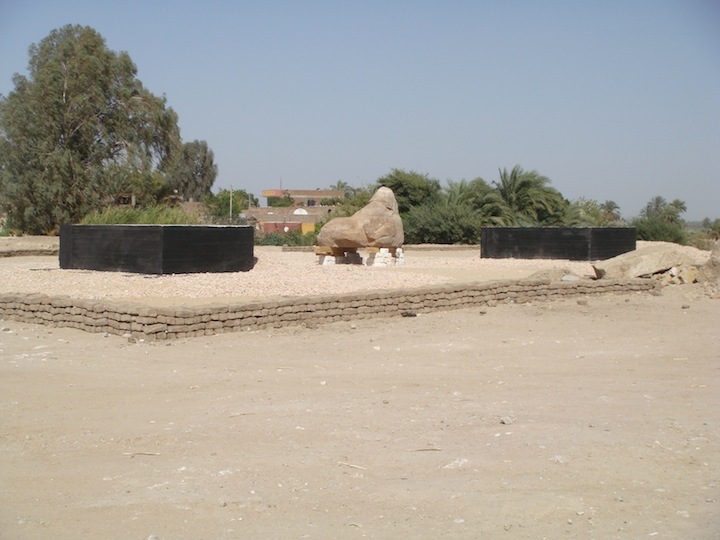 North Site - The two black basis where the re-erected colossi will stand. 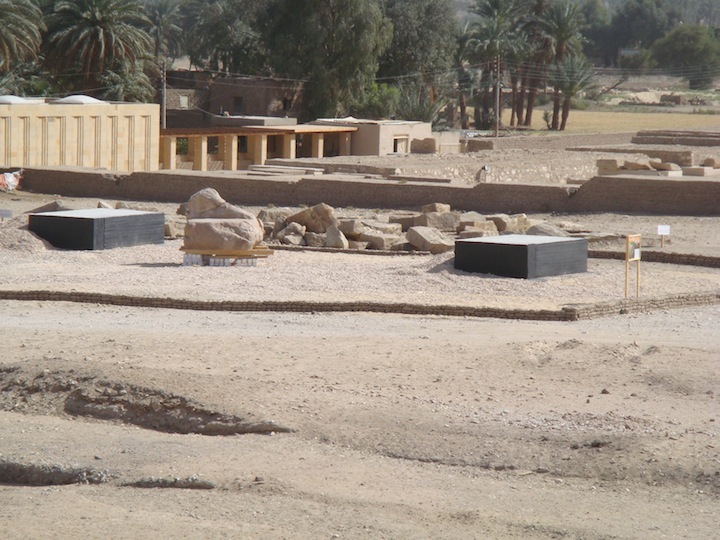 Plinths to take newly erected Colossi - North end.